With the growing popularity of a number of high intensity training programs, more men are setting up their very own home gyms with the very same professional equipment commonly found at the local gyms. One of the more commonly seen equipment used at many of these professional-home gyms are adjustable dumbbells. Men who hunger the traditional pump from a total body workout have found it quite difficult to purchase several dumbbells in order to benefit from the number of exercises known for targeting the various muscle groups generally associated with strength training. Fitness enthusiasts who are dedicated to their home resistance exercise workout have been observed to use three distinct brands of adjustable dumbbells, from Power Block, Universal and Bowflex. All three brands are quite similar in their price and quality and can be easily purchased on ebay for about three hundred bucks. The Power Block Classic adjustable dumbbell allows the training individual with the option of adjusting the used load in increments of five-pounds beginning with five pounds and progressing to as much as forty-five pounds with the support of a weight pin. 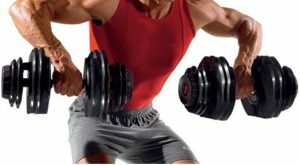 The handle of the dumbbell is padded and designed to offer adequate support for men with weak wrists with a twelve inch handle more suited for Power Block users than the sixteen inch SelectTech set for specific exercises. Individuals who require training using weights in excess of forty-five pounds are able to train under these loads by using a heavier weighted barbell or handle. Most men have found the padded outer handles an excellent feature allowing the dumbbell to provide a well-balanced experience contrary to many of the other brands. However some men have found the general appearance of the square weights to be quite an unattractive characteristic coupled with the occasional difficulty experienced when inserting the pin into a new plate while the dumbbell is placed on the ground often resulting in placing the dumbbell on an elevated object such as a bench or table to make the task easier. The Bowflex SelectTech adjustable dumbbell unlike the Power Block and Universal dumbbells increases it's loads used when training in increments by 2.5 pounds from five to twenty-five pounds by adjusting a dial located at the end of the dumbbell contrary to the pin used in the Power Block. Men with more of a slender built frame and longer limbs have preferred the Bowflex adjustable dumbbell a recognizable choice for performing their training exercises with the option of adjusting the exercise loads in smaller amounts specially for biceps and triceps curls. Each Bowflex adjustable dumbbell set is sold with a complementary workout DVD video instructing the user on the proper exercise techniques and an additional two year warranty on the weight plates. Individuals who have purchased the Bowflex adjustable dumbbell have praised the comfort of the ergonomic grip and thicker handle to provide a luxury experience. The Universal Power-Pack adjustable dumbbells are the only dumbbells manufactured today with it's very own space saving pedestal-free weight rack. Somewhat similar in design to the Bowflex dumbbells, the load adjustments selected from four to forty-five pounds are achieved with the assistance of a similar dial. In contrast to the Bowflex adjustable barbell which are adjusted observing the rotation of both dials found at both ends of the adjustable dumbbell, the universal power pack can be easily adjusted by turning the dials located at either end of the dumbbell. The hexagonal shape of the weights have been widely accepted by many of the fitness enthusiasts throughout the industry as a suitable feature preventing the dumbbell from rolling away while placed on the floor.